Priced: $95.95 - $160.00 Rated: - 4 stars out of 5 by 19 reviews. Salomon XA Pro 3D Ultra 2 GTX Trail-Running Shoes for Men Features. Salomon XA Pro 3D Ultra 2 GTX Trail-Running Shoes for Men. Enjoy working out with the Salomon XA Pro 3D Ultra 2 GTX Trail-Running Shoes for Men. The Salomon XA shoes come with a 3D Advanced Chassis between the midsole and outsole that maximizes energy control and performance. These running shoes have the unique quicklace system tightens these shoes with a single pull. Since these shoes come with the sensifit upper construction that connects to the lace-points for a secure, wrapped fit. An interesting feature of these shoes are the energy cell midsole that gathers the energy that is created while running and stores it for you to charge your mobile electronic devices. These shoes come with gusseted tongues that keep out dirt, water, pebbles, and others making them clean and safe to use. The rubber toe cap protects your toes from rocks and roots making them very comfortable to use. Have fun using the Salomon XA Pro 3D Ultra 2 GTX Trail-Running Shoes for Men. I won a pair of Salomon Men's XA Pro 3D Ultra 2 GTX Shoes by winning an apple-bobbing contest here at Moosejaw. Hands down the best prize I've ever won in my many years of apple-bobbing. I used to wear them as a day-to-day shoe, but after using them on a hiking trip I've relegated them to be a trail-only shoe. Don't get me wrong, they're great as an everyday shoe, but they're SO GOOD on the trail that I'm saving them for that. Lightweight, durable, stable, the XA Pro 3D Ultra 2s excel in any condition. They'll block out the wetness on a sloppy trail but are still breathable enough to prevent internal moisture buildup. FEATURES of the Salomon Men's XA Pro 3D Ultra 2 GTX Shoe. SPECIFICATIONS of the Salomon Men's XA Pro 3D Ultra 2 GTX Shoe. Tackle varying terrain with confidence in the Salomon XA Pro 3D Ultra 2 GTX trail-running shoe. 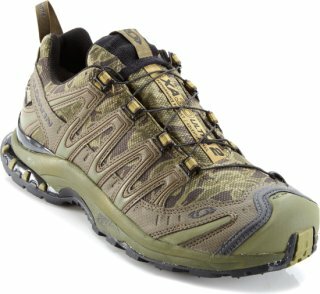 This men's outdoor shoe features a breathable and lightweight polyester mesh upper with thermoplastic urethane overlays for extra support. The GORE-Tex XCR seam-sealed inner bootie provides waterproof protection; the polyester lining wicks away moisture. The non-marking Contagrip™ rubber outsole of the Salomon XA Pro 3D Ultra 2 GTX trail shoe enhances durability and traction. The Salomon XA Pro 3D Ultra 2 GTX shoe is light, durable and stable for the most demanding trails, the XA Pro 3D Ultra 2 GTX® has a streamlined profile and great durability with a new outsole design, plus the year round climate comfort of GORE-TEX®. The supportive comfort and superior grip of the XA Pro 3D Ultra 2 GTX® from Salmon® will make sure you feel confident in every step no matter what the elements throw your way on the trail. GORE-TEX® technology ensures breathable, waterproof protection. Mud guard and protective rubber toe cap. -shaped footbed with OrthoLite® cushioning boasts antibacterial technology that helps wick moisture away and reduces odor. Compression-molded and dual-density EVA midsole with Energy Cell 2 and pronation control provides enhanced stability and lasting cushioning. The Salomon XA Pro 3D Ultra 2 GTX Trail-Running Shoes handle all-terrain running with aplomb, thanks to aggressive traction, responsive support and GORE-TEX® waterproof protection. A versatile combination of light weight, durability, stability and protection for fast hiking or running on rough terrain and technical trails, the XA Pro 3D Ultra 2 GTX® has established itself as one of the most imitated shoes on the market. Tighten the Salomon Men’s XA Pro 3D Ultra Trail Running Shoes for your sprint-length or multi-day adventure race. Seam-sealed waterproof breathable Gore-Tex XCR membranes keep your feet dry and fresh, while triple-density EVA midsoles absorb and disperse impact, which reduces jarring throughout your body. Gone are days when your 10 miles into a trail run, you just hit your runners high and then suddenly you notice one or both of your shoes have become untied. Nothing brings progress to a halt like stopping. After tying your shoe laces it always feels harder to get back into the groove and it seems like your chasing what you felt before you stopped. When you put these shoes on and tighten them not only do they stay snug around your feet as a whole reducing friction, the cause of annoying blisters, they stay that way. These shoes in particular can be used for anything from backpacking for people that want a sturdy supportive breathable shoe that don't like boots to marathons. It is a shoe that looks good and performs even better. Salomon has cornered the shoe industry in my opinion and due to it's sheer innovation and manufacturing quality. For most people you will wear yourself out before these shoes do. I used them as everyday shoes and for backpacking trips (I don't like boots!). They offer better arch support than the same model I purchased about four years ago (yes, it was time for a new pair!). They held up just fine over 40 miles of rocky and sometimes swampy trails. My feet felt fine after walking over rocks for hours and hours, and they had no leaks while walking though minor water and swampy areas. I don't really like the pull laces, and I found with my last pair they tended to wear through the fabric near the toe. So, I plan to put a regular set of laces on the shoe, but that's no big deal. My feet are a bit wide, and these fit fine. I bought these for winter trail running and as a light hiking shoe. They have not disappointed. They are a little warm compared to a non Goretex shoe, but when its cold out, I don't want wet feet. I wear them around town a lot too. Great for wet or slushy parking lots. I may consider a non Goretex pair for warmer months. I found they initially fit a little narrow, but got better with wear. I can't wear them with heavy socks, but they are running shoes so I guess that should kind of be expected. The lacing system is way cool too. First off, in comparison to the Salomon SpeedCross 3 Climashield shoe, These fit seemingly wider and I think more true to size. These shoes are great, they have good tread, the goretex liner is killer, and keeps you bone dry. For hiking and approaches they have plenty of support, and are even awesome for walking to class on wet days. However, has a running shoe- there are many better options. These shoes are on the heavier side of things, and feels "clunky" if you while running. It may be just my opinion, but these are definitely not my dedicated running shoe. They keep my feet warm because they allow good air flow* My feet stay dry because of the waterproofing *They keep me standing excellent support and traction* Kevlar laces are perfect. I have had three pair, just wished the soles did not delaminate in a year . Yet the two year Solomon warranty keeps me satisfied, but it is getting old. Great shoe if it fits your foot right. Unfortunately my ankle is too low and constantly rubs on the neck of the shoe causing terrible rubbing and ulcers on my fibula condyle. Aside from that solid shoe great quality and cool lacing system. My only negative is that it is really heavy so not good for someone concerned about weight. I am ordering another pair of these after trying the Synapse WP. I have had these for almost 2 years and they are great. Look forward to another pair. I have hiked all over Colo and UT with this with numerous 10 + mile hikes in them.... Amazing shoes. Wear these daily. Bought to replace my Asolo hiking boots. Extremely comfortable. I have a neuroma in my left foot, and I can wear these without an additional orthotic. Water proof is nice, though a low top. I wear a 1/2 size larger than my normal 12 US. Bought a pair for pre and post skiing, but within six months the left shoe made sweaking noises. So, Backcountry's excelant service accepted a return and replacement. The quick lace system is great for easy on and off during winter weather in the mountains. I have two pairs of the Mid Height GTX versions and bought these. I put them on and hiked about 6 miles with no break in. They are light, comfortable and an excellent hiking shoe. Buy a half size smaller than you would. I had a previous pair of Salomon XA Pro 3D Ultra 2 GTX (what a mouthful that is!) shoes. They were the best trail running shoes ever. When they went on sale, I decided to buy another pair. They are not the same shoe. The bed is much narrower - a claim made about other Salomon shoes as well - and just feel tight. Backcountry should inform buyers of these kind of changes made by the manufacturer before transacting the order. I concur with the fit and blister commentary. I had a pair of these, purchased three (3) years ago, which were virtually perfect. The new ones, which I am returning, seem to be produced by a different vendor. The upper heel cup is much less stiff, and tends to collapse. The achilles rubbing, causing abrasions and blisters, is intolerable. This is a shame, because the previous pair served me well. This is my second pair and I am disappointed. The build quality of the shoe is far less than the pair before. It has worn through the material by the laces in under a year which never happened to my first pair. The lace system inevitably begins to fail over time and will not stay tight. I plan to look elsewhere for waterproof shoes after this most recent experience. Iv'e been in Salomons since 1998, when I bought my first pair of GTX XCR's. My current GTX is 5 years old and they are bullet proof! With some trepidation, I purchased the new model. Fresh out of the box, I hiked Mt. Abraham in Maine. Two days later they took me up Mt. Katahdin. Both hikes traverse some fairly rugged terrain, with lots of steep, rocky climbs that include some bouldering. Anyone who has hiked these mountains knows that protected feet make a happier hike. That being said, these are not your fathers Salomons!! They are still a very tough, but fairly lightweight shoe, but I agree with some previous reviews, that the fit isn't the same. It feels boxy and hasn't come close to molding to my feet the way older versions do. The lacing system doesn't stay tight, so I find myself stopping to tighten constantly; so annoying. Also, I am not a fan of the one fabric lace loop. All the others are reinforced as they are on the older GTX shoe. This setup is similar to XT wings and it WILL rip if you like the shoes and actually use them. I run in XR Missions, but for hiking these are my go to sneakers. I only hope that Salomon stops over thinking itself and sticks with what works. I was also a little confused when one shoe had a tag that indicated a wide fit, which was not indicated when I ordered. I've worn these shoes for over five years including many 100 mile runs. They've fixed the lace issues, but the build quality seems to have dropped in this year's version. The inserts fell out within the first few weeks. The seams in the shoe also appear to be coming apart. I'm hard on my shoes, but you expect Salomon shoes to handle it. I hope these shoes get more on-par with the next release. I got my pair about a year and a half ago and they were great for a while. These are my everyday shoes and also for hiking/mtn. biking. After about a year, it's almost as if someone hit a self-destruct button. The sole started to split from the upper and some other minor rips here and there. Overall, they were a great shoe.....just until they gave out. Beware.